afferent neuron one that conducts a nervous impulse from a receptor to a center. efferent neuron one that conducts a nervous impulse from a center to an organ of response. 2. (type II): stellate neurons with short axons that are particularly numerous in the cerebral and cerebellar cortices and in the retina. multisensory neuron a neuron in the cerebral cortex or subcortical regions that can receive input from more than one sensory modality. postganglionic neurons neurons whose cell bodies lie in the autonomic ganglia and whose purpose is to relay impulses beyond the ganglia. preganglionic neurons neurons whose cell bodies lie in the central nervous system and whose efferent fibers terminate in the autonomic ganglia. sensory neuron any neuron having a sensory function; an afferent neuron conveying sensory impulses. The first in an afferent pathway is the primary sensory n. and the second is the secondary sensory n.
the basic nerve cell of the nervous system, containing a nucleus within a cell body and extending one or more processes. Neurons can be classified according to the direction in which they conduct impulses or according to the number of processes they extend. Sensory neurons transmit nerve impulses toward the spinal cord and the brain. 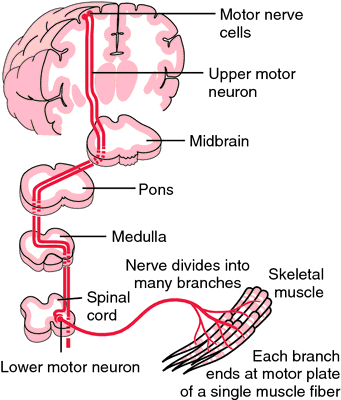 Motor neurons transmit nerve impulses from the brain and the spinal cord to the muscles and the glandular tissue. Multipolar neurons, bipolar neurons, and unipolar neurons are classified according to the number of processes they extend to the different kinds of neurons. Multipolar neurons have one axon and several dendrites, as do most of the neurons in the brain and the spinal cord. Bipolar neurons, which are less numerous than the other types, have one axon and only one dendrite. Unipolar neurons have one axon and no dendrites. All primary sensory afferents and some autonomic neurons are unipolar. 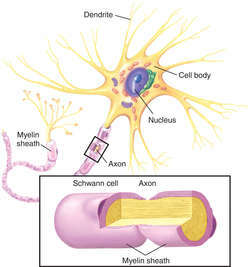 All neurons have one axon, and most have one or more dendrites and have a slightly gray color when clustered, as in the nuclei of the brain and the spinal cord. As the generators and carriers of nerve impulses, neurons function according to electrochemical processes involving positively charged sodium and potassium ions and the changing electrical potential of the extracellular and the intracellular fluid of the neuron. Also spelled neurone. neuronal, adj. The morphologic and functional unit of the nervous system, consisting of the nerve cell body with its dendrites and axon. A neuron that conducts sensory impulses toward the brain or spinal cord. A neuron that mediates impulses between a sensory and a motor neuron. 1. A neuron that bears two processes. 2. A neuron of the retina that receives impulses from the rods and cones and transmits them to a ganglion neuron. See: retina for illus. A neuron whose axon crosses to the opposite side of the brain or spinal cord. A neuron whose axon carries motor impulses away from the brain or spinal cord. A small nerve originating in the anterior horns of the spinal cord that transmits impulses through type A gamma fibers to intrafusal fibers of the muscle spindle for muscle control. A neuron of the retina that receives impulses from bipolar neurons. Axons of ganglion neurons converge at the optic disk to form the optic nerve. A neuron that carries impulses from the central nervous system either to muscle tissue to stimulate contraction or to glandular tissue to stimulate secretion. A neuron with one axon and many dendrites. A neuron whose process constitutes a part of the peripheral nervous system (cranial, spinal, or autonomic nerves). A neuron of the autonomic nervous system whose cell body lies in an autonomic ganglion and whose axon terminates in a visceral effector (smooth or cardiac muscle or glands). A neuron of the autonomic nervous system whose cell body lies in the central nervous system and whose axon terminates in a peripheral ganglion, synapsing with postganglionic neurons. A nerve cell that uses serotonin as its neurotransmitter. A neuron whose cell body bears one process. The cells within the body which make up the nervous system, specifically those along which information travels. Morphologic and functional unit of nervous system, consisting of nerve cell body, dendrites, and the axons. n a nerve cell; the basic structural unit of the nervous system. There is a wide variation in the shape of nerve cells, but they all have the same basic structures: cell body, protoplasmic processes, axons, and dendrites. The neuron is the only body cell whose principal function is the conduction of impulses. It cannot regenerate when the cell body is destroyed; however, cell processes such as axons and dendrites can often regenerate. a nerve cell; any of the conducting cells of the nervous system, consisting of a cell body, containing the nucleus and its surrounding cytoplasm, and the axon and dendrites. Neurons are highly specialized cells having two characteristic properties: irritability, which means that they are capable of responding to stimulation; and conductivity, which means that they are able to conduct impulses. They are composed of a cell body (the neurosome or perikaryon), containing the nucleus and its surrounding cytoplasm, and one or more processes (nerve fibers) extending from the cell body. The processes are actually extensions of the cytoplasm surrounding the nucleus of the neuron. A nerve cell may have only one such slender fiber extending from its body, in which case it is classified as unipolar. A neuron having two processes is bipolar, and one with three or more processes is multipolar. Most neurons are multipolar, this type of neuron being widely distributed throughout the central nervous system and autonomic ganglia. 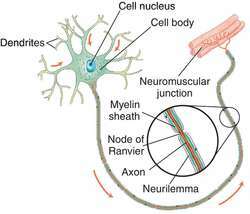 The multipolar neurons have a long single process called an axon and several branched extensions called dendrites. The dendrites receive stimuli from other nerves or from a receptor organ, such as the skin or ear, and transmit them through the neuron to the axon. The axon conducts the impulses to the dendrite of another neuron or to an effector organ that is thereby stimulated into action. Many processes are covered with a layer of lipid material called myelin. Peripheral nerve fibers have a thin outer covering called the neurilemma. nerve cells which secrete norepinephrine as a neurotransmitter; they are mostly sympathetic postganglionic nerves plus some within specific brainstem foci. nerves which synthesize the neurotransmitter acetylcholine in their terminals; they include α-motor neurons of the spinal cord, cranial nerves innervating skeletal muscle, preganglionic sympathetic and postganglionic parasympathetic neurons. neurons found in the brain and spinal cord that conduct impulses between neurons such as from afferent to efferent neurons. Called also association neurons or interneurons. neurons of the hypothalamus that receive nervous impulses from higher centers and translate them into the regulation of hormone secretion. release nitric oxide as a neurotransmitter. in the hypothalamus; regulate the secretion of adenohypophyseal hormones via releasing and inhibiting factors. neurons whose cell bodies lie in the autonomic ganglia and which relay impulses beyond the ganglia to the effector organ. neurons whose cell bodies lie in the central nervous system and whose efferent fibers terminate in the autonomic ganglia. the transmission of impulses along axons by means of electrical impulses and across synapses by neurotransmitters, especially norepinephrine and acetylcholine. Koliatsos, "Evidence that nerve growth factor influences recent memory through structural changes in septohippocampal cholinergic neurons," Journal of Comparative Neurology, vol. You can think of it as an off-the-shelf biopharmaceutical that when injected into the human brain will induce the target neurons to produce or express and secrete only nerve growth factor and therefore provide support to NBM cholinergic neurons," he explained. HET] mice have reduced ACh transmission by central cholinergic neurons (22), compensatory mechanisms, such as supersensitivity of cholinergic receptors, could account for the normal sleep-wake physiology. 4 The hypothalamic orexin system directly and strongly innervates and potently excites noradrenergic, dopaminergic, serotonergic, histaminergic and cholinergic neurons. Orexin--does it have a role in mental illness? 2004) and in cholinergic neurons of the medial habenular nucleus (Miyake and Itoh 1996), and is involved specifically in neurite outgrowth (Hart et al. University of California (Oakland, CA) has patented a specific clinical protocol for use toward therapy of defective, diseased and damaged cholinergic neurons in the mammalian brain, of particular usefulness for treatment of neurodegenerative conditions such as Alzheimer's disease. EEG desynchronization occurs during wakefulness as well as REM sleep and the NA-ergic neurons in LC and the cholinergic neurons in LDT/PPT are known to be responsible for EEG desynchronization through their projections to thalamus. Alzheimer's brains show another distinct characteristic: a significant loss of cholinergic neurons and acetylcholine receptors, in addition to the hallmark plaques and tangles, said Dr. Differential firing patterns of the peptide-containing cholinergic neurons B15 and B16 during feeding behavior in Aplysia. Target-specific regulation of synaptic efficacy in the feeding central pattern generator of Aplysia: potential substrates for behavioral plasticity? Cholinergic neurons are specifically affected in AD (see section below on biological mechanisms). Abnormal regulation of corticopetal cholinergic neurons and impaired information processing in neuropsychiatric disorders.